These come with our Jumbo index, with larger corner pips for easy reading! See style LOWVIS for our low-vision pips! This is an absolutely stunning deck of fully customized playing cards. Your custom design or logo is printed in spot or full-color on the common-side of all the cards in the deck along with all the sides of the box in which the cards are packaged. Cello-wrapped for wonderful presentation. These are great for job fairs and trade shows, for travel companies, airlines, as professional sports team giveaways, nursing homes or hospitals. 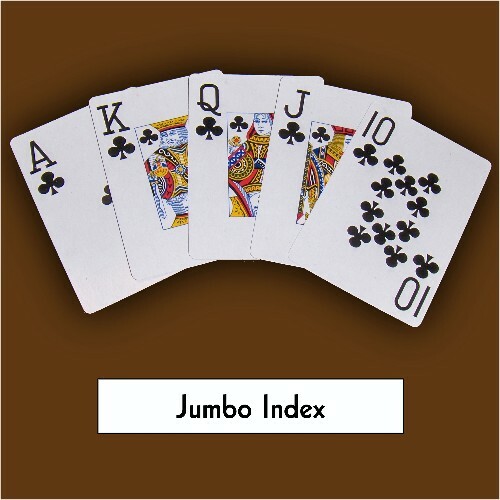 Jumbo index is available also on our casino-quality and 100% plastic decks. Lead time for less than 1000 decks is 17 business days. Lead time for 1000 decks or greater is 33 days. If you are looking for a faster lead time for 1000 decks or greater, call or see item number 280PR.